The Bilderberg group wants to make the people a slave! Researcher Daniel Estulin warns of secret elite society: the Bilderberg group. The Bilderberg group is an exclusive elite club, where people from all world topmilies, from industrialists to politicians and nobility, can officially talk to each other. These are bad words, but Daniel Estulin has studied the Bilderberg group for a long time. He is one of the few who has inside information. Through his father and grandfather, Estulin has contacts in the world of intelligence services, and in addition, all the participants in the Bilderberg Conference are not as convinced of the legitimacy of the goals and are willing to give information, sometimes at risk of career or even living . 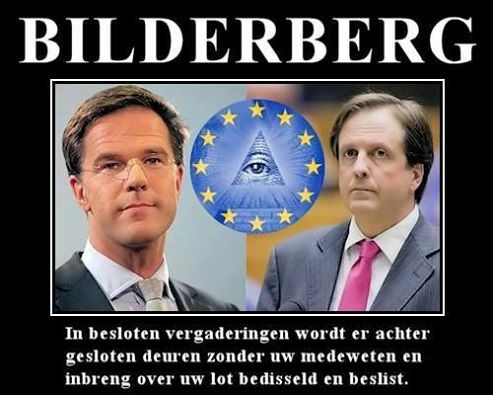 The Bilderbergclub is a secret international organization of financiers, politicians and multinational companies and was founded in 1954 under the influence of Dutch prince Bernhard, who believed that many problems could be avoided if influential people from the world were to control the world. A kind of shadow world government, so. The first conference took place in Bilderberg Hotel in the Dutch Oosterbeek, hence the name. Since then, the society has gathered regularly, in strictly sealed luxury hotels and in the deepest secret. The list of members reads as a selection of the most influential and wealthy people, including Henry Kissinger, banker David Rockefeller, Romano Prodi, who was chaired by the European Commission in September 1999, former United States Defense Minister Donald Rumsfeld and former president Bill Clinton but also the Belgian Ethienne Davignon, who is chairman of the electoral circle. All participants accept absolute disclaimer. Neither on the agenda nor on the internal discussion nor on any conclusions, it is only communicated with one word to the outside world. The fact that this is certainly contrary to active democrats for active politicians and senior officials does not require any argument. Daniel Estulin has been wearing the Bilderberg club for years, always knows how to flee where and when the meeting is scheduled and wrote about the club as shocking as a fascinating book, already a best seller in many countries. "After Bilderberg meetings I have often made predictions, including the demise of Margaret Thatcher and the latest spectacular oil prices. Believe me, I'm not a clairvoyant, but base me on inside information. Behind the doors of the Bilderberg Conference, decisions are made that touch us all. And that will be more tangible in the future. " Do not the Bilderbergers already have all the money and power they want? Daniel Estulin: "Yes, but they especially want to keep that up. This can only be achieved by world control, and that aims to achieve the Bilderbergers through the creation of a global company: a world government of puppets with the Bilderbergers as the pop players. It sounds contradictory, but what the super-capitalists of the Bilderberg group pursue is a kind of socialist dictatorship. That kind of central and authoritarian government would give them the ultimate monopolies. How did the nobility become rich at the time? By levying toll and taxes and creating monopolies. How have America's supermillionaires become rich? By taking advantage of state monopolies on the expansion of the American rail network in the nineteenth century. How are those billionaires getting richer today? By equally shameful taking advantage of the ultimate state monopoly: the army. The Bilderbergers are not only politically and financially at the top, they also lead the international military-industrial complex. In addition, Bilderbergers control the two main world trade: drugs and oil. If the Bilderbergers were to lead a central world behind the scenes, they would be given a freelance. For drugs, that is already the case. International drug trafficking is a billionaire business. Ever wondered how the unimaginable money is being washed white? That can not be done per hundred euros, because the cash flow is far too big. No, that happens through big banks and respectable international companies, via Wall Street and the London Stock Exchange. When I started my research, I spoke with a top seller, a Bilderberger. "You will never understand the group if you do not know how money works and how to make money," he said. He is right. And should we be surprised? The CIA is already monitoring major drug trafficking in the sixties. With that money, they funded campaigns and put governments in a hurry. That is documented. The invasion of Afghanistan, in addition to control over essential oil pipelines, gave them more control over heroin trade. And because of the destruction of Yugoslavia, they have assured themselves of the main delivery lines from heroin to Europe. Experts do not doubt: if all drug money would be taken out of the world economy at once, it would collapse. And nobody has so much economic power if he does not belong to the Bilderbergerclub. That is not possible. Hence the hard attitude towards the Colombian cocaine cartels. Those are outsiders that one wants to keep small. The Colombians understood that after the threat of an American invasion. They are no longer trying to buy US companies and are pleased to buy a limited number of shares that provide a satisfactory profit. Whole washed, of course. Whiter than white even. Are there any other factors? A second reason why the Bilderbergers want to ensure the world's power is the knowledge that our oil reserves are no longer as high as is officially claimed. At the present pace, there is still less oil for twenty years. A 1974 document entitled "US Population Study", directed to Henry Kissinger, states that the population should reduce by 500 million people by 2000 and by 3 billion by 2050. If oil is getting scarce, food production and transport will also become expensive, not to mention heating and other utilities. That will make the population of course self-evident, I think. It is also for the oil that America has invaded Iraq. You do not believe that Bush only believed one hundred seconds in the myth of Saddam's weapons of mass destruction? The same goes for 9/11. I'm not talking about or other dark forces than the Muslim extremism behind the 9/11 attacks, but it seems to me that the US government knew what was going to happen. Had one wanted to prevent those attacks. Why did not you want? Because it caused an excuse to first take Iraq and then Afghanistan. And because it produced an external enemy. The first because of the oil interests, the second because one wants to make individual freedom more and more bound. For who wants to do this as an idiotic conspiracy theory: there are precedents. It has been historically demonstrated that the US government knew of the pending Japanese attack on Pearl Harbor. More even: more ships have been sent to Hawaii in order for the ravage and indignation of American public opinion to be optimal. That was necessary to bring the States into World War II. And from among publicly-produced documents, a Operation North Woods was thought of in 1962. That was an American plan to inflate its own ships and enter into Cuba's victims. That plan was blocked by Kennedy, but the intention is on paper. And we know what happened to Kennedy. In other words, the Bilderbergers need a boeman, and this time Osama bin Laden and Allah. In the name of this threat, Bilderbergers are becoming more and more fundamental citizens around the world. Whoever protests is being dismissed as an antipatriot or even a terrorist. Those who doubt this must wonder why Bush has declared the global war on terror without even thinking about addressing the true roots of evil: poverty, frustration, mutual ignorance, American foreign arrogance. With the money already spent in Afghanistan and Iraq, many people could have helped. You also fear a huge explosion of the electronic Big Brother. You do not have to be a conspiracy theorist to realize that it's going on: You can not make a payment, do not make a purchase, do not cross a major street, do not take a plane without being registered, filmed, checked. Now the Bilderbergers try to get people's chipping out. The subcutaneous application of chips under the mood of ease of use and safety. Possibly linked to vaccinations. Can you continue to refuse if it is compulsory for air travel? One wants to make the norm so that who refuses to socialize himself socially. Cash money is getting more and more for virtual money. If cash money completely disappears, money will be no more than a few digits on a screen. With one push of the button, one can let them disappear tracefully and dissolve dissidents and otherwise think economically. Of that, Stalin, Hitler or Mao could only dream. But that kind of dictator is in the shot of the Bilderberg group to wait for his chance. The Bilderberg Group does not even eliminate liquidation, you say. "Three attacks have been committed to my life. Bilderbergers are behind the murder of Aldo Moro, behind the Watergate affair, which cost Nixon and behind the political liquidation of Thatcher. Why does not that come in the news? Because the Bilderbergers check the media. It is apparent from pieces of the American Congress that in 1915 the 27 most important millionaires of the States shared the 135 most important papers of the country. Now there are about 12-15 major newspapers in the States, all of which are monitored by Bilderbergers. The same goes for the television chains, large publishers and movie companies. The Bilderbergers also do not compromise elegant solutions. I received money to stop my investigation. And politicians never touch the international summit when they do not get to the Bilderberg club. Also your prince Filip is a Bilderberger. Not for his skills, but as a future king of the Belgians. By the way, almost all royal families in the Bilderberg group are represented. If the fall of Communism has proved something, or that too strictly controlled society, which can not be sinned and human creativity does not gain freedom, ever have to explode. Each dictatorship goes down or down. In the long run, the Bilderbergers do not do a good thing, it seems to me. On the contrary, they are convinced, and when they succeed they are chanted for a long time. The mass will be busy enough to survive. And those ordinary people do not count for them. For them, economics must not be in service of man, but vice versa. It is therefore important to mobilize and raise awareness, including trade unions and consumer organizations. By way of this we can stop the plans of the Bilderbergers. And while I do not make any illusions, hopefully I will contribute to this awareness with my book. "